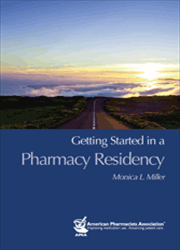 Getting Started in a Pharmacy Residency is designed to provide student pharmacists with concise, insightful information about postgraduate residency options; helpful advice about applying for residency positions; interviewing techniques; and information on preparing a curriculum vitae. Information on postgraduate industry fellowships is also provided. CCC RightsLink Get rights to make copies and share. "Overall, I was impressed with the examples provided of e-mails to residency program directors for requests for information as well as letters of intent. Many 'Sidebars' can be used as guides on their own, particularly the various lists of questions. From the faculty perspective, this text may be useful to supplement mentorship of students looking to attain residency." "This will make a nice addition to any pharmacy school's library to help students in their residency journey. It includes good information to help students become more competitive and seek the residency that is best for them by helping them ask the right questions." "The conversational writing style plus the sidebars with insights from residents and directors make this an easily accessible guidebook for busy pharmacy students juggling school and the pursuit of postgraduate training." Doody's Score 94 - 4 Stars! • Concise information about a wide variety of postgraduate training options. • Information on preparing the residency application, including sample curriculum vitae and letters. • Tips for researching and connecting with residency programs. • Interviewing techniques, including sample questions. • Discussion of the match and the post-match "scramble." • Interviews with former pharmacy residents and industry fellows.